We collect any and/or all of the following, depending on what particular form you fill out, and store the data at our operations centers, including but not limited to those in the United States. Our online forms collect your name, email address, address, telephone number, and information about your collecting and selling habits and interests. Our free email notices require only an email address, first and last name are optional. Our registration for participating in online auctions collects your name, email address, address, telephone number, and a valid credit card. We may also obtain information about you in person, or through mail, email, text, social media or other source. Morphy Auctions researches our customers’ usage patterns and demographics based on the information provided to us during their experiences on our website. We do this to better understand our customers’ needs and enhance our service. This information is compiled and analyzed for internal use. Registration qualifies a user as a Morphy Auctions’ customer and regardless of any regulation to the contrary, such user agrees, until this consent is revoked in writing, that Morphy Auctions may from time to time contact the user concerning sale and purchase opportunities available through Morphy Auctions. 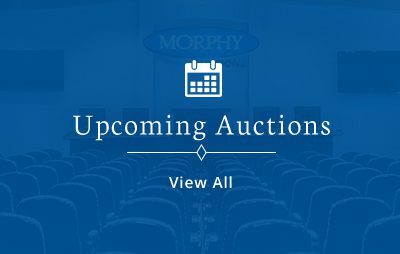 Morphy Auctions may employ third parties to perform functions on its behalf, including, but not limited to: fulfilling orders, delivering packages, sending postal mail and e-mail, removing repetitive information from customer lists, analyzing data, providing marketing assistance, providing search results and links (including paid listings and links), processing credit card payments, and providing customer service. They have access to personal information needed to perform their functions, but may not use it for other purposes. Finally, we may disclose information to fulfill certain legal and regulatory requirements or if we believe, in good faith, that such disclosure is legally required or necessary to protect others’ rights or to prevent harm. Other than as stated herein, all information is held in confidence by Morphy Auctions. We do not sell your information to third parties nor do we provide it for any third party’s general commercial usage. Any information disseminated to parties’ external to Morphy Auctions is anonymous in nature – for example: the prices realized for a particular auction may include the price paid for a lot. Morphy Auctions maintains reasonable physical, electronic, and procedural safeguards to protect the security and integrity of all Personal Information provided to us. Morphy Auctions limits access to personal information about you to those employees who we reasonably believe need to come into contact with that information to provide products or services to you in order to do their jobs. In the interest of privacy and security, we automatically expire your session when a specific period goes by without activity. Morphy Auctions takes reasonable precautions – including administrative, technical, and physical measures – to safeguard your personal information against loss, theft, and misuse, as well as unauthorized access, disclosure, alteration, and destruction. Morphy Auctions has safeguards in place to keep your personal information accurate, complete, and up to date for the purposes for which it is used. Naturally, you always have the right to access and correct the personal information you have provided. You can help us ensure that your contact information and preferences are accurate, complete, and up to date by going to your customer account page. For any personally identifiable information that cannot be updated via your my account page, please make a request to have it changed, if needed, using the contact information listed below.